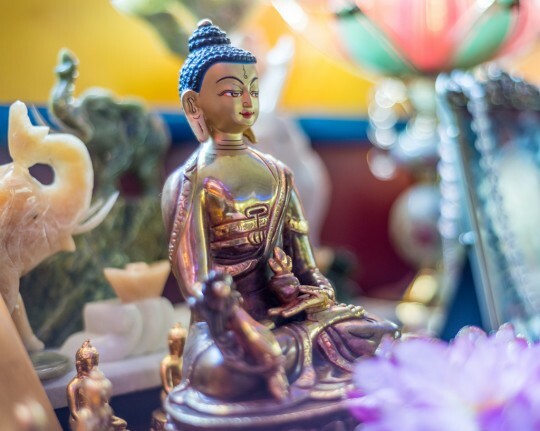 Altar detail at Kachoe Dechen Ling, Aptos, California, 2014. Photo by Chris Majors. “At the beginning, when the Sangha was flourishing, Lama Yeshe got all the monks and nuns to take turns to cook for the other Sangha members. Ven. Pemo didn’t know how to cook, so when it was her turn, she put some vegetables in oil and then served them raw,” Lama Zopa Rinpoche said in November 2014 to Ven. Ailsa Cameron. “If you know how to make food, it is very beneficial. The highest benefit – bringing great purification of negative karma and delusions and collecting merit – is to offer delicious food to the guru. You can also make so many people happy by making delicious food for them. Scribed by Ven. Ailsa Cameron, November 2014, Bendigo, Australia. Lightly edited by Michael Jolliffe for inclusion on FPMT.org. More advice from Rinpoche can be found on the page “Advice from Lama Zopa Rinpoche” on FPMT.org. More information, photos and updates about FPMT spiritual director Lama Zopa Rinpoche can be found on Rinpoche’s webpage. If you’d like to receive news of Lama Zopa Rinpoche via email, sign up to Lama Zopa Rinpoche News.